Geoffrey Byfield, President of the Liguanea Chess Club carried a team of 14 players to Miami for the annual Orange Bowl held January 3rd-5th. The Jamaican contingent traveled to Miami in search of success and came back with more than they bargained for. Led by 10-year old Tewana Mellace, the team copped the Under-12 title at the Junior Bowl Championship and finished fourth in the Under-19 section, while at the Miami International they placed second in the Under-12 and Under-19 categories. 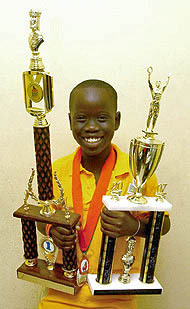 Mellace, several times national champion for different age groups, scored 6½/7 adding to his impressive cache of trophies in the Mellace household. Tewana is the son of National Master Andrew Mellace. According to the article in the Jamaican Observer, other players who excelled were Marq-Brandon Pitter, who finished seventh at both tournaments, Taj Buckley and Damani Reid, who were ninth in the Under-12, at the Miami and Junior Orange Bowl tournaments, respectively. The article also stated that Byfield was especially proud of Mellace, whom he says has a great future in the game. "He was the best Jamaican performer at the tournaments, and I have heard him being described as the best in his age group in the English-speaking Caribbean," remarked Byfield. Look for a brighter days for the young Jamaican star. Read, "Liguanea Chess Club turns heads," Jamaican Observer, 13 January 2007.